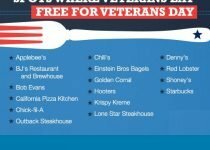 Veterans Day 2018 Free Meals: Chipotle, Texas Roadhouse, Little Caesars, Red Robin, Chilis, Buffalo Wild, Applebees, Olive Garden, Free Food, Freebies, Deals, Places Veterans Eat Free Today. 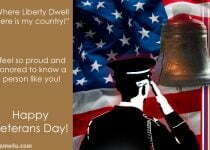 Veterans Day is a day on which United States Of America Honor all who served for their Country. Like Each and Every Year, this year also, several restaurants and businesses are offering special deals for dedicating it as a small way to say thanks to veterans who all served on this Veterans Day 2018. Meanwhile, this year Veteran’s day is also more special because of completing 100 years of Federal holiday celebration as well as it’s observed on November 12 due to Sunday (November 11). While Veterans Day takes place on November 11 as well as November 12, So some of these free meals, free food, freebies, deals will be offered on or through November 12. Below is a list of local deals for veterans who choose to dine in. Bertucci’s: Free small cheese pizza Sunday and Monday. Buffalo’s Café: 50 percent discount for veteran and military Sunday. Buffalo Wings & Rings: Five free wings and a free beverage Sunday. Cotton Patch Cafe: Free Chicken Fried Steak or Chicken Fried Chicken Sunday. Creamistry: 50 percent off any single item Sunday and Monday. Daphne’s: 10 percent discount Sunday. Famous Dave’s: Free two meat lunch combo Sunday and Monday. East Coast Wings + Grill: Free meal from special menu Sunday. El Fenix: Free meal from special menu Sunday. Fogo de Chão: 50 percent off meal Veterans’ Day weekend Friday through Sunday and 10 percent off for up to three guests’ meals. Freebirds World Burrito: Veterans and active military get a buy-one-get-one free deal on full-size entrees Sunday. Friendly’s: Free Big-Two-Do breakfast or free All-American Burger meal for lunch or dinner. GetGo Cafe + Markets: Free coffee or fountain drink, excluding made-to-order and packaged beverages Sunday. Also available for first responders. Golden Corral: Military Appreciation Night is Nov. 12 from 5-9 p.m. 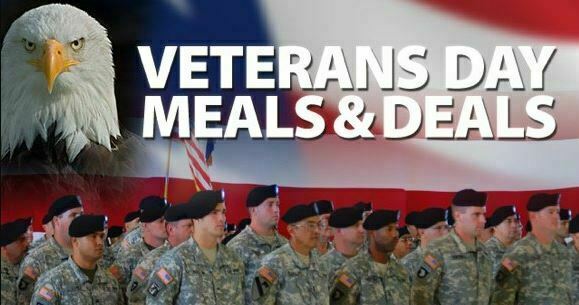 Anyone who has served in the U.S. military is eligible to receive a free meal. Grimaldi’s Pizzeria: 15 percent off Sunday and Monday. Not valid in New York, New Jersey and Connecticut. Hickory Tavern: Free Tavern Burger with the purchase of a beverage Sunday. IHOP: IHOP is offering free red, white and blueberry pancakes to all veterans and active duty military on Nov. 12 from 7 a.m.- 7 p.m. Proof of service required. Jimboy’s Tacos: Free meal up to $10 at participating locations Sunday. Kolache Factory: Free kolache and a free coffee Sunday. LaMar’s Donuts: Free doughnut and 12-ounce coffee Sunday. Margaritas Mexican Restaurants: Free meal Sunday. Max & Erma’s: Free cheeseburger, fries and fountain drink Sunday. Menchie’s Frozen Yogurt: Free six ounces of frozen yogurt Sunday. Miller’s Ale House: 50 percent off meal Sunday. Mimi’s Cafe: Free meal from special menu Sunday. Native Grill & Wings:Free menu item up to $11.99 Sunday. Ninety Nine Restaurant & Pub: Free meal from special menu with purchase of another entree from 11 a.m. to 4 p.m. Sunday. On The Border: Free Create-Your-Own combo meal Sunday. Pilot Flying J: Pilot Flying J is offering active duty and retired military veterans a free breakfast Nov. 11 and 12. Breakfast includes free Pilot Coffee of any size with a choice of a PJ Fresh breakfast sandwich, packaged pastry item or a Cinnabon Center of the Roll. Download (or open) the myPilot app through Nov. 12 to find a coupon in myOffers. Pluckers Wing Bar: Free meal, side and non-alcoholic beverage, up to $15, from 11 a.m. to 11 p.m. Sunday. Dine-in only. Ponderosa and Bonanaza Steakhouses: Veterans can choose a free buffet and beverage or 50 percent off a menu item. 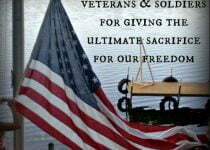 Some locations will honor veterans Sunday and other locations on Monday so check with your closest location. PT’s Taverns: The chain will offer happy hour selections throughout the entire day to veterans and active-duty service members who present a valid military ID Sunday. Quaker Steak & Lube: Offers vary by location. Rock Bottom Restaurants & Breweries: Vets eat free Saturday through Monday. Plus, each brewery will be brewing a limited-edition Veterans Day IPA and Saturday through Nov. 12, 25 cents from every pint will go to a local Veterans charity. Shake Shack: Free scoop of Shake Shack Custard at all locations Sunday. Sheetz: Free six-inch turkey sub and a regular size fountain drink Sunday. 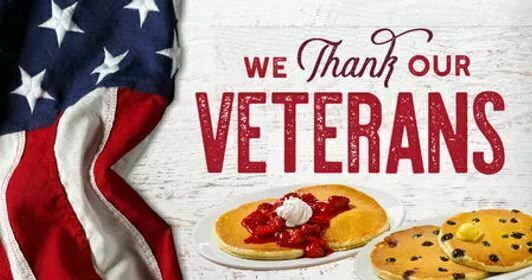 Shoney’s: All veterans and active duty military can receive a free breakfast bar Nov. 12 from opening until 11 a.m.
Sizzler: Free lunch from special menu until 4 p.m. Sunday. Taco Cabana: Free Brisket Taco Sunday. The Greene Turtle: Free meal up to $12 Sunday. Walk-On’s Bistreaux & Bar: Free classic burgers Sunday. Wienerschnitzel: Free Chili Dog, small fries and a small drink Sunday. Wild Wing Café: Veterans eat free on Nov. 11, choosing from any Awesome Salad, Wild Wrap, Beefy Burger or Chicken Sandwich. White Castle: Free combo meal for veterans and active military members who dine in or go through the drive-thru Sunday and Monday. Yogurt Mountain: Get free 6oz. yogurt on Nov. 11 at Yogurt Mountain. Offer good for active duty and retired military. Valid military ID required. Zoës Kitchen: Free meal Sunday and Monday with a valid military ID. All participants must present a valid military ID or proof of service. On Monday, Nov. 12th, all veterans and active duty military can select from a complimentary menu from 11 am to 10 pm. 11/12/18 participating restaurants will offer veterans and active military professionals a special $9.99 Certified Angus Beef® Top Sirloin Steak, mashed potatoes, broccoli and a non-alcoholic beverage. 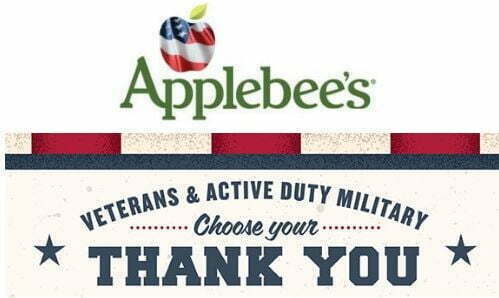 Veterans and active duty military can receive a complimentary meal on Mon., Nov. 12. Veterans and active-duty military eat lunch for free on Monday, November 12th from 11:30 am-3 pm. Please show valid ID. Chicken Salad Chick is offering a free Chick Special and regular size drink to any veteran or active-duty military personnel who visits on Monday, November 12. Mon., Nov. 12, veterans may eat for free plus a bottled beverage. Offer valid at participating restaurants. 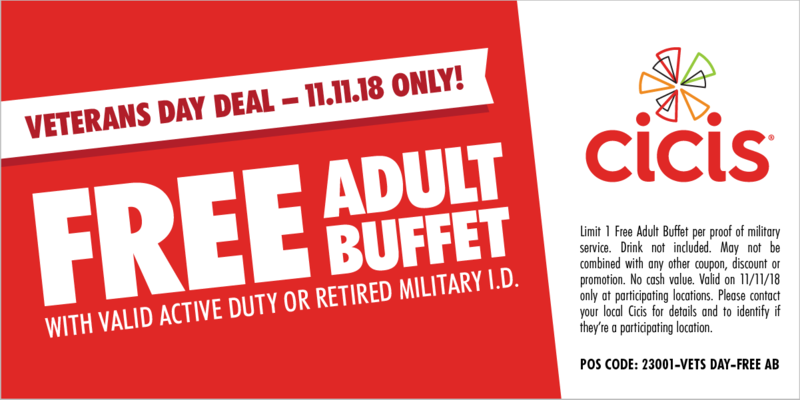 Veterans and active military eat free on Monday 11.12.18 (Limit $15). Veterans, military members and their families can enjoy a free taco any Exchange Taco Bell or Taco John’s on Monday, November 12, 2018. Most Hy-Vee’s are providing a free breakfast buffet for veterans during regular breakfast hours on 11-12-18 from 6-11 am. All active duty military, veterans and reservists with proof of service can enjoy a complimentary meal from a select menu that includes a beverage on Mon., Nov. 12, 2018, at any participating Country Pride or Iron Skillet restaurant nationwide. Monday, November 12, 2018, all veterans and active duty members of the military are invited to enjoy a Ruby’s adult entrée on the house. All veteran and active duty military personnel receive a complimentary meal from a select menu on Mon., November 12th from 11 am to 10 pm. A free entree and a drink is offered to military veterans and active duty on Sunday, 11-11-18. Active, reserve, and retired military personnel receive a free meal on Tuesday, November 13 from 2 PM – 8 PM.